Bidding online is now open. Online auction closes May 8, 2019. Click images for a larger view. Click on the blue BID NOW buttons to place a bid online. Online bidding closes Wednesday, May 8, 2019, at 5:00 pm. Guests attending the fundraiser will have the opportunity to place additional bids on the works of art while at the event. Winning online bidders will be notified on Tuesday, May 14, 2019. Payment will be accepted online or can be arranged with the Kelowna Art Gallery by calling 250-762-2226. UV screenprint on paper, 33 x 27 in. Moozhan Ahmadzadegan is an emerging artist studying at the University of British Columbia Okanagan campus. His practice includes painting, printmaking, and design. Often engaged with social and political themes, the objective of his practice is to create works that inspire contemplative thinking and encourage dialogue. forged steel, cast glass, 13 x 24 x 5 in. Doug Alcock was born in Kelowna to creative parents and five older brothers. His life as a maker started early, inspiring four decades of metal working in various capacities of form and function. His work can be found in private and public collections worldwide, including seven public art sculptures in the Okanagan. His website is www.alcockart.com. Evan Berg is an artist based in Kelowna, British Columbia. He holds a certificate in Documentary Film Production from Capilano University and will graduate with a Bachelor of Fine Arts from UBC Okanagan in 2019. His work considers digital cultures and their role in contemporary life. Berg explores this through the mediums of video, sculpture, sound, photography, animation, and installation. He has exhibited work locally in the Okanagan, and internationally in Germany and Bulgaria. Recently he has been shortlisted for the Lind Prize, with an exhibition at the Polygon Gallery in May 2019.
mixed media, oil on metal, 24 x 37.5 in. There has been an evolution in Rose Braun’s work over the years, from her earliest approach in a tightly realistic mode, to her current looser methods of application and rendering. In 2000, Braun began working with steel panels as supports. Interested in the resistance they provide, she enjoys the process of etching them with acid. Braun strives to keep her work feeling raw and uncontrived, leaving specific interpretations of her artwork to the individual viewer. Connor Charlesworth is a Canadian contemporary artist, currently based in Kelowna, British Columbia. He received a Master of Fine Arts from the University of Victoria with a specialization in painting, and a Bachelor of Fine Arts from the University of British Columbia Okanagan campus. He has exhibited in group and solo exhibitions in Canada, as well as in student exhibitions abroad (Bulgaria and Egypt). He currently teaches painting sessionally at Thompson Rivers University in Kamloops, British Columbia. Charlesworth’s recent work is primarily concerned with themes of place, wellbeing, and psychology, and manifests itself through a multi-disciplinary approach to painting and installation. oil on canvas, 15.5 x 39.5 in. Rod Charlesworth received a diploma in fine arts from Okanagan College in the 1970s and has been exhibiting across Canada ever since. Engaged with and aware of the extensive history of Canadian landscape painting, Charlesworth is committed to providing his viewers with a refreshing approach to the landscape. His work comments on beauty and the ephemeral within the landscape, rendered in a unique manner of mark making described as his visual vocabulary. Ken Gillespie was born in Vancouver in 1948, spending most of his life in Calgary before moving to the Okanagan in 2000. A senior signature member of the Federation of Canadian Artists, Gillespie has participated more than forty exhibitions. His works are held in collections around the world, and have been reproduced in magazines, including International Artists. oil on canvas, 24.5 x 28.5 in. Jessica Hedrick studied visual arts at the University College of the Fraser Valley in Abbotsford, British Columbia. She currently lives in the Okanagan, and recently completed 365 portraits for The Face of Kelowna project in connection with the Canadian Mental Health Association. Hedrick creates artwork to celebrate life, the outdoors, and interesting people, hoping that the viewer experiences her interests through her art. oil on canvas, 27 x 34 in. For the past thirty years Jim Kalnin has lived in the Okanagan Valley, working as an art instructor. Since retiring in 2009, his interests in painting, travelling, and enjoying life’s mysteries have been rekindled. He has exhibited his art extensively in British Columbia, and has authored two books, The Spirituality of Art (co-written with his wife Lois Huey-Heck) and The Spirituality of Nature. acrylic on canvas board, 10 x 12 in. Rachel Kambeitz is a Canadian artist best known for her large portraits using bright vivid oil paints, featuring detailed eyes and inspired palette knife work. Additionally, Kambeitz creates bright cityscapes using acrylics and oils and intricate sketches with a variety of pens and pencils. Her website is rachelkambeitz.com. lithograph, 30 x 24 in. Nobuo Kubota was born in Vancouver. He received a Bachelor of Arts in architecture from the University of Toronto in 1959. He decided he was more interested in art and was part of the initial stable of artists with the Isaacs Gallery in the 1960s, and a member of the Artists’ Jazz Band. Kubota has an international presence and is widely known in Canada. Kubota was given a solo show at the Kelowna Art Gallery in 1999, and had a solo show again in 2010, touring from the Robert McLaughlin Gallery in Oshawa, Ontario, Hokusai Revisited. He lives and works in Toronto. Maureen Lisle studied fine arts at Okanagan College, carpentry at Okanagan University College, furniture design and construction at Selkirk College and the Inside Passage School of Cabinet Making at Robert’s Creek. A Kelowna based wood turner and wood worker, Lisle is now retired from the University of British Columbia Okanagan as a technician in the Creative Studies department. Since her retirement, she enjoys the challenges of woodturning, sharing the beauty of locally harvested woods. Born in Newfoundland, Charla Maarschalk received a Bachelor of Fine Arts from the University of Calgary in and afterward completed a New Media program at Sheridan College. Now based in Kelowna, Maarschalk is interested in exploring the purpose of human relationships through the use of colour, fabric, texture, and human experience, while simultaneously conveying a sense of joy and generosity of spirit. acrylic on canvas, 34 x 34 in. Anita McComas received a Bachelor of Fine Arts from Virgina Commonwealth University and is now a Signature member of the Federation of Canadian Artists, and an Elected Member of the Society of Visual Artists. Her landscape and wildlife paintings are celebrations of colour, with an emphasis on water and its reflections. Represented by Lloyd Gallery in Penticton, Artym Gallery in Invermere, British Columbia, and Fallen Leaf Gallery in Canmore, Alberta, McComas is currently the feature artist at Little Straw Winery in West Kelowna. Her website is www.anitamccomas.com. Jo McKechnie has been working with glass for over thirty-five years. She creates custom-designed stained glass windows, among other glass pieces, working with with warm (fused) glass. Inspired by light streaming through textured and coloured glass, McKechnie works out of her downtown Kelowna studio, La Luz Glassworks Studio. McKechnie’s work was included in Saskatoon’s Artists on Tour event in 2013, as well as Lake Country’s Art Walk, and Vancouver’s Harmony Arts Festival. Her work has been shown at the Hambleton Galleries in Kelowna, and in various Blue Shore Financial locations in Vancouver as part of their British Columbia Artists promotion program. acrylic on canvas, 30 x 24 in. Sarah Neely is a born-and-raised Kelowna artist and marketing director. She obtained a Bachelor of Management degree from the University of British Columbia and holds a decade of marketing and strategic management experience. Since she was a child, Neely has been creating, painting, and drawing, re-discovering her love for painting when she entered motherhood. oil on birch panel, 17.5 x 20 in. Destanne Norris holds a Bachelor of Fine Arts (Honours) from the University of Victoria and an Master of Fine Arts from the University of Tasmania in Australia. Primarily a landscape-based oil painter, her paintings have been exhibited in university and public galleries. Her work can be found in private, corporate, and permanent collections. A documentary film will soon be released by En Queue Film, titled Beneath the Painted Surface, about her healing journey through nature and art. Liz Ranney received a Bachelor of Fine Arts from the University of British Columbia Okanagan. Co-Director of the New Arts Collective, she is a painter, graphic designer, illustrator, and instructor. She infuses her work with bright and bold colour and explores portraiture through the lense of connection, interaction, and expression. Ranney currently instructs art classes and workshops at the Kelowna Art Gallery and New Arts Collective. Some of her recent projects include large indoor murals for Canoe Coffee Roasters, Don’t Look Down Tattoos, and École George Pringle Elementary. In 2015 Ranney had a solo painting exhibition at the Jane Roos Gallery in Toronto. Her website is www.lizranney.com. Bonny Roberts lives and works in Keremeos, British Columbia. She has taken numerous workshops with a variety of instructors, the most influential being Richard Nelson of Hawaii. Roberts feels the most important element in her paintings is colour, which she uses to create excitement and emotion in each of her works. acrylic and ink on canvas, 16 x 16 in. Synnöve Seidman studied art history and philosophy at the University of Toronto, and Art Restoration and Integrative Language Studies at L’istituto Europeo in Florence, Italy. She has been painting in her current dynamic and energetic contemporary style for a decade, incorporating abstract landscapes, city structures, and botanical elements into her many compositions. Featured by Saatchi Art curators in the weekly Collections, she has also been published in international publications including Art Maze Mag, and Create Magazine. Seidman has shown across Canada and her work has been collected worldwide. acrylic on canvas, 12 x 24 in. Leanne Spanza is a self-taught landscape artist living in Lake Country with her husband and two young kids. Originally working in the engineering field, she started painting while on maternity leave in 2009 and entered into Kelowna’s Artwalk in 2010. She dove into full time painting in 2012, inspired by British Columbia’s landscapes and her hiking adventures. 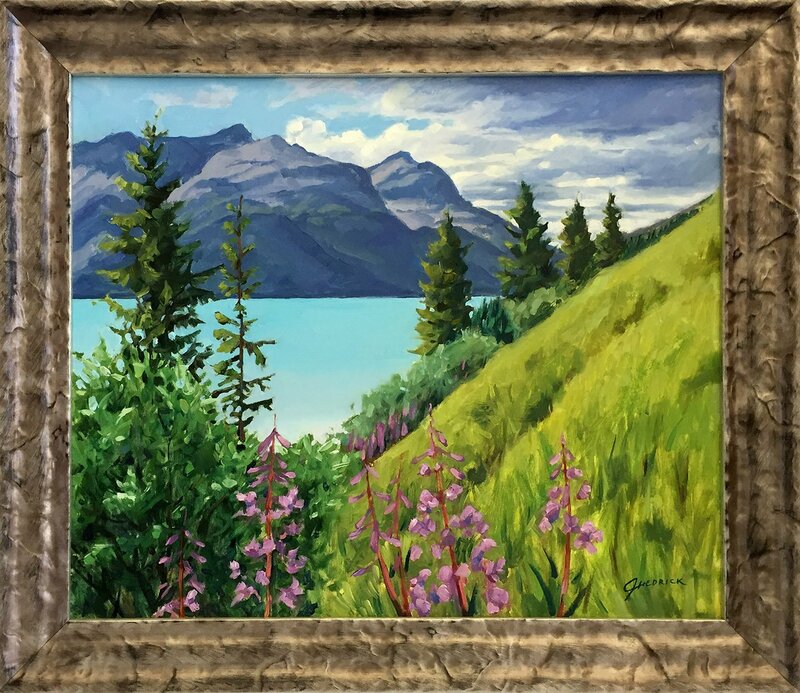 Her colourful landscapes have been collected across North America and Europe and she has been showcased through Parks Canada, Kelowna Tourism, and the wonderful galleries and shops that support her art. Her website is www.leannespanza.com. acrylic on canvas, 18 x 18 in. David Wilson Sookinakin was born and raised in the Vernon area and is a member of the Okanagan Indian Band. Based on pictographs found on several sites in the Okanagan region, the artist creates a re-interpretation of traditional stories. While taking business courses, Sookinakin worked and learned Native art forms from Coastal Salish and Haida artists in Vancouver. After the exploration of West Coast and Plains First Nations’ art forms, he started to draw inspiration from his connection to the Okanagan Nation art. Sookinakin’s artwork draws on the symbols and stories of his Okanagan First Nations heritage and culture with an emphasis on the meaning and symbolism of the art of the Okanagan People.